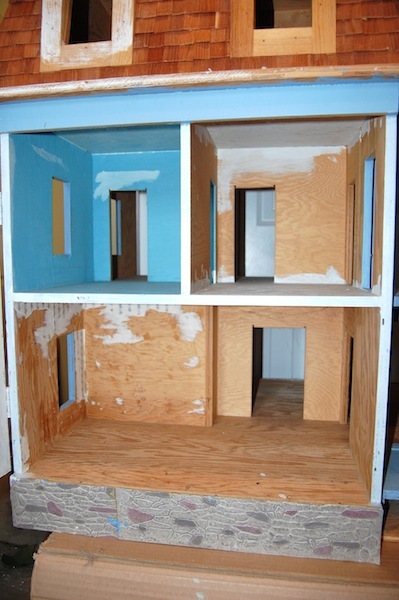 I saw a "homemade" dollhouse on Craigslist for $50 and I could not resist it. It is SOLID wood and weighs MORE than a ton. Seriously!!! This has to be the heaviest house I have ever encountered. After doing a little research, I found out that this house is called The Amberwood, by Jacqueline Kerr Deiber. There are a lot of rooms but they are on the smaller side. I could see inside the front dormer windows that there was a room in the attic but there was no way to access it. I grabbed my Stanley knife and cut through the shingles. 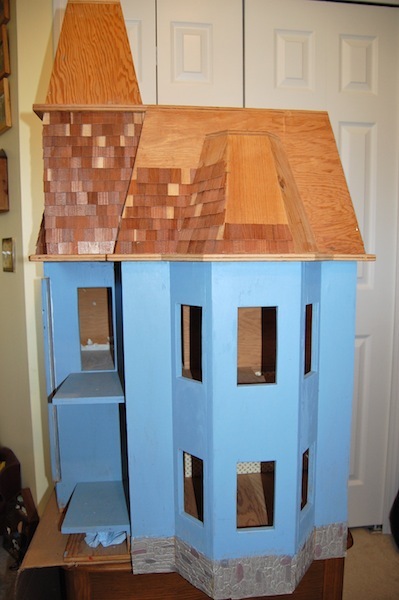 I then had to pry the front panel open as it had been nailed closed and shingled over. What a waste of perfectly good rooms!!!!! There were hinges, so it was supposed to open. Anyway, this should be fun to renovate. Wow, that is a great find! Those attic rooms would make an awesome master suite! Can't wait to see what you do with this and who ends up getting to live there. Thanks Phyllis. I think an attic bedroom suite would be wonderful. 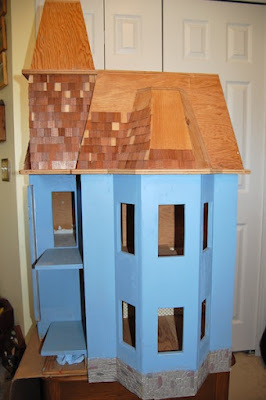 I am excited to see which one of my dolls wants to live here as well! 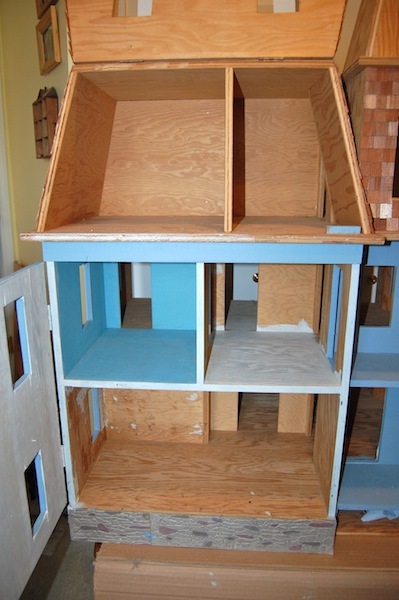 I have done a custom dollhouse by plans by Jacqueline Kerr Deiber and her houses are HUGE and HEAVY. It opened from the front and back and was electrified. Hardest house hubby and I did plus it was landscaped, but it was a beauty. You have a FIND there! Enjoy! Thanks Lisa. This house is definitely on the heavy side. 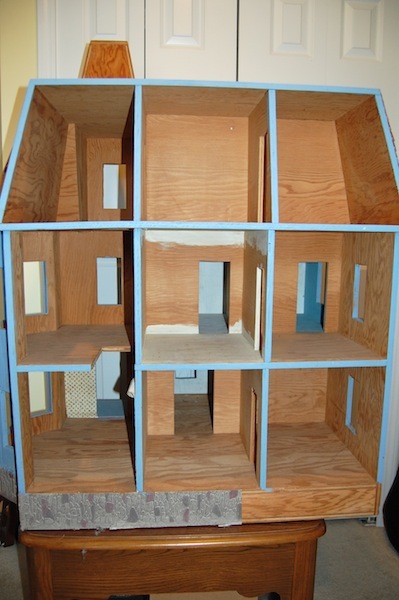 (I would really like to get a Pepperwood dollhouse as well.) 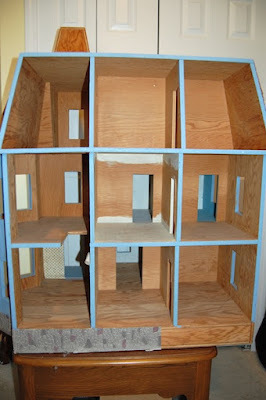 I love front and back opening dollhouses, they are so interesting to me. That's what I'd call a real good bargain... great that you've saved this treasure. Thanks Birgit. I do love a good bargain! This will be an interesting house to renovate for sure. What a fabulous find Sam. Lots of potential, and I agree with you regarding the attic . . . what a waste to nail it shut like that. I really could not believe that they had nailed the attic shut, but it was great to find the extra space.